Push the handle C to the right and tilt the tailgate D gently. Raise the tailgate D , push it fully to close it, check that it is secured correctly. Before opening the boot, ensure that no one is within the radius of opening. For reasons of safety, correct operation and compliance with regulations, do not drive with the boot and the lower tailgate open. If the battery is disconnected, the boot cannot be opened. Do not climb onto the lower tailgate and do not subject it to heavy knocks, it may be damaged. 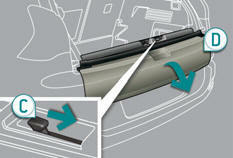 Always close the lower tailgate and check that it is secured correctly before closing the boot. When closing the lower tailgate, ensure that no person or object is in the proximity of the moving parts to avoid any risk of injury or damage. Do not open the lower tailgate when a towbar is fitted. 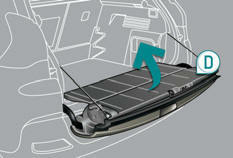 Maximum authorised weight on the lower tailgate when open: 200 kg .